RFID has been hotly anticipated for many years. The hope was that items could be tagged and the user could walk into a room and detect every piece of equipment with a tag. This would certainly boost productivity, but in reality this is still a long way off. These are most commonly injected beneath the skin of pets. They are also popular in cow tracking applications. These tags are usually very easy to spot, as they are bright yellow and attached to the cow’s ear. These are commonly used in access control application, with the tag being either a smart card, or keyfob. NFC also falls under the HF frequency, but the tags are usually encoded in a different way, so cannot usually be used interchangeable with HF readers. They are also usually read by touching, or very nearly touching the reader. They were at one stage very popular on cellphones, but more and more manufacturers are choosing to include them only on their more expensive phones. NFC is commonly used with payment applications, i.e. Apple Pay, Google Pay, etc. Most popularly used in supply chain applications. The predominant standard for UHF tags is EPC Gen2. With UHF there are also three different tag types. The most popular is Passive. 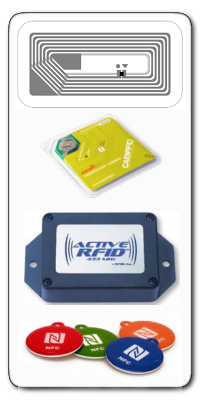 This means that the RFID reader comes into close proximity to the tag, as per the other types. The other type is BAP (Battery Assisted Passive). This means that the tag has a small battery, but the read is still activated by the reader. The final type is Active. These tags have a battery and are constantly broadcasting their identifier at regular intervals. Their major benefit is that they can broadcast their ID much further.